NASA is sponsoring a team developing a new type of payload to collect ionospheric plasma data at multiple points near a suborbital main payload. These low-resource, easily reproducible payloads—called Bobs—were developed for the NASA Isinglass auroral sounding rocket mission (conducted in February 2017 at the Poker Flat Research Range in Alaska). Much of the current understanding of the ionospheric environment has been gathered from singlepoint measurements. However, there are fundamental questions about energy and disturbances in plasmas that require measurements at many points in time to understand. The following parallel situation illustrates why such measurements are important. If a journalist reporting about hurricane conditions moves away from the coast over several days and reports improvement in the situation, it is not apparent whether conditions are improving with time or with distance from the coast. On the other hand, several reporters deployed simultaneously in multiple positions could distinguish the effects of time from those of space. Likewise, a swarm of instruments can differentiate changes in space and time that a single-point instrument cannot. Scientists have used NASA's sounding rocket program to collect multi-point ionospheric measurements before, but historically the sub-payloads have been complex, and therefore relatively expensive. The goal of this effort was to develop sub-payloads that can carry plasma physics instrumentation, but are reproducible in large numbers. 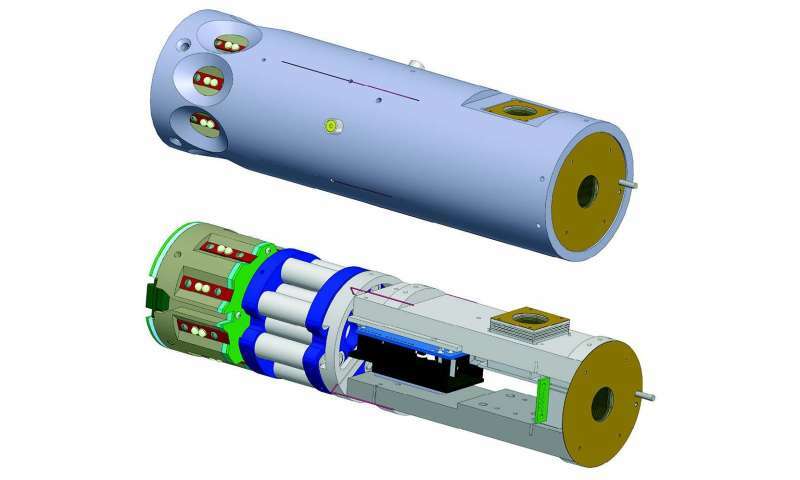 To develop the Bob sub-payloads, the team took advantage of the design of previous sub-payloads that were used to release chemicals, but did not contain instrumentation. The team reused the deployment and envelope parts of the design, but adapted the chemical release portion of the design into a small Arduino-based instrumentation package capable of local (several km) communications back to the main payload. The Bob sub-payloads each carry two thermal ion sensors (retarding potential analyzers) as well as a small commercial inertial measurement unit (IMU) like that found in a handheld video game controller. The technology developed for the Bob subpayloads will enable NASA to deploy lowresource sensors to measure changes in the ionosphere at multiple locations at the same time. These economical sensor swarms will provide a detailed picture of ionospheric processes, enabling scientists to learn more about the complex systems at work in Earth's upper atmosphere. In 2016, the team studied the results of the 2015 test flight mission that successfully deployed two of the Bob sub-payloads over Wallops Island. Using information from this test flight, they finalized and improved the design of the Bobs to be used as Isinglass sub-payloads. In late summer of 2016, the team delivered ten copies of the Bob payload and associated instrumentation to NASA Wallops Flight Facility for integration with the other Isinglass instrumentation. At the time of this writing the Isinglass team was in the field for the launch campaign; four of the Bob sub-payloads were cleanly and successfully released from the Isinglass B main payload, and the science team is in the process of assessing the results.